“The Letters of Samuel Beckett, Volume 1: 1929-1940,” published in 2009 by Cambridge University Press, will receive the eleventh Morton N. Cohen Award for a Distinguished Edition of Letters by the Modern Language Association. The volume is the product of the Letters of Samuel Beckett Project, based at Emory University’s Laney Graduate School. Editors of the winning edition are founding editor Martha Dow Fehsenfeld, Lois More Overbeck of Emory, George Craig of University of Sussex in England, and Dan Gunn of American University of Paris. The Cohen Award is one of 18 awards to be presented Jan. 7, 2012, during the association’s annual convention, to be held in Seattle. The award is presented once every two years. 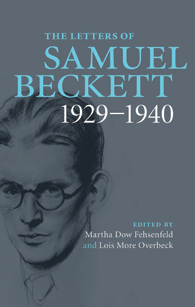 “The Letters of Samuel Beckett, Volume 2: 1941-1956” was published by the project in October of this year and already has begun receiving widespread critical acclaim.